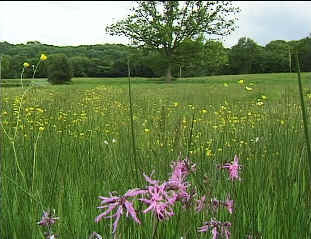 Thus old wildflower meadows provided habitats for numerous plant and animal species. Today, 98% of wildflower meadows have been lost because of urbanisation, road building, forestry and agricultural intensification. As a result, some of the plants which grew in these wildflower meadows are now endangered or even extinct in Britain. However, such fields produce low yields of hay and the number of livestock which can graze these fields is far less than the efficient intensive grassland would support. In today's economic climate, these wildflower meadows are uneconomic. In the past the winter feed for ruminants was usually hay. Today little hay is grown on intensive grasslands. Hay is dried grass and is cut far later in the season than grass cut for silage. Thus species such as Grey Partridge (left) and pheasants which nest in grass, had time to hatch their young. The slow machinery of yester-year allowed more time for animals to escape the cutting mechanism. The later cutting of hay fields also meant there were far more invertebrates for the chicks to feed on. Hay fields therefore, have higher biodiversity than silage grasslands. Before tractors became commonplace, which occurred after World War 2, agricultural machinery would have been horse powered. Even so, tasks such as hay making required an enormous amount of physical labour. Farms at this time, typically had small fields and a range of crops which also benefited biodiversity.